Thanks to candid insights from mega-star self-published authors like Joanna Penn, Mark Dawson, and Joe Konrath, it’s now known in the writing community that if you want to build a sustainable career, you have to write and publish lots of high-quality books. But writing isn’t the only point on an author’s to-do list. There’s also, editing, cover design, advertising, social media, and a variety of other jobs, all of which contribute to turning a well-crafted book into a potential bestseller. Opposing authors tackle this mountain of tasks in very different ways. While some become sleepless, one-person bestseller factories, learning to do every job under the sun, others pursue the traditional publishing route, sacrificing a large slice of their income in the hope that their publisher will manage many of their jobs for them. Neither tactic is ideal. One approach leads to burnout, while the other means sacrificing a large portion of your income forever with no guarantee that you’re publisher will do the jobs any better than you. Now the solution, according to Penn, Dawson, and Konrath is simple; create a bestseller team, a squad of freelance employees who can do particular tasks better and faster than you without taking a share of your income for your entire career. If you don’t mind handing over some control and a one-off payment for the sake of your own sanity, hiring them will leave you with the time to do the all-important writing that will get you onto your next book – and a new stream of income. This one is you. I put you on this list because you need to remember to do your job. Not only are you the captain of this ship; you’re also its investor. If you’re paying a team of freelancers to help with your workload then you’d better be using the time you’ve freed up to write more books. Not only will the extra practice make you a better writer, but more books will generate more income. Beta readers read the rough draft of your book and give you general feedback on what works in your story. If you have a group of trusted friends who will give you useful and constructive feedback then these can be your beta readers. Otherwise, many editors offer a diluted version of their services online as beta readers. Online professional beta readers are usually extremely affordable or even, in some cases, free. Next comes editing. Now I’ve talked about the importance of editing and the different stages of the editing world in my last post. All a newbie writer needs to know is that editors are critical for success. They’re what separates struggling authors from successful authors. This isn’t a job you can do yourself; you’re too close to your own work to scrutinise it effectively. Hire a professional editor. Choosing the right one as it will lead to a long-term relationship. Designing good covers is time-consuming and hard to get right if you’re not an experienced designer. That’s why a professional designer is essential in a bestseller team. Not only do they save the writer time and bring a level of professionalism to the designs that many authors can’t replicate, but they also give some much-needed advice when it comes to commerciality and making a book appeal to its target readership. Now this was a new concept for me but all of the self-publishing juggernauts agree that it’s the most effective marketing strategy for getting early book reviews. Aside from having a mailing list of readers who get to find out about your latest events and promotions (here’s mine if you want to join it), a street team is an elite list of avid readers who like your stuff and are most likely to read and review your work. You give them free e-copies of your latest releases, days before any official launch. Now this may seem like career suicide. Why give your books away to the only people who are likely to buy them? Well, the idea behind building a street team is that they create a surge of activity around your book online on the official day of the launch, generating early reviews and buzz quickly instead of you having to wait months for your book to gain momentum. This temporary profile boost enables your book to reach new readers. Invest in building a street team. Now I’m not saying you hire a person in this case. Advertisers are usually online businesses like BookBub or BookSends that offer packages where they email thousands of readers, and promote your book through social media sites during a promotion. They specifically target readers of your genre. Depending on the company, their success varies wildly. And some of the best require you to have a handful of good reviews even before can apply to them. However, if you haven’t yet built a large street team, these are your fastest channels to the bestsellers lists. I’ve been doing a lot of research concerning creative rights lately and what I’ve found is that this is a convoluted area. A bestselling book might come with movie deals, merchandising, multimedia gaming, and a procession of other opportunities, all of which can be spilt up with contracts that are, in most cases, baffling. Due to this confusion, authors often sign away rights that can be exploited by companies without ever seeing the benefits themselves. If you want to maximise income yourself and you’re not a legal wizard then you’ll probably need to hire a lawyer. They represent you and will save you money in the long term. Plus, their services can protect you from bamboozling contracts and even those within your own team. Agents can be great, but they can also rip you off or not do anything at all. These are one of those people you may need a lawyer to protect you from if everything goes awry. For the sake of this blog post, though, let’s just assume all agents are good. It’s commonly known that, in this new age of digital self-publishing, publishers are losing their relevance. However, what most successful authors agree on is that agents have not lost their worth. While they may take a larger piece of your pie than any other person in your team, agents are able to go one step further than lawyers, negotiating industry-specific terms that can make them – and more importantly their authors – more money. As well as that, their emotional distance from the books means that they can help authors to decide upon level-headed business decisions and ultimately manage the business side of their author’s affairs, including speaking events, movie deals, or graphic novel adaptations. This, again, allows authors the time to do what they love to do: write. In terms of my own career, I haven’t managed to fill all the roles of my bestseller team yet – but that doesn’t matter. This model is based on the teams I have seen created by some of the most successful self-published authors in the world, and it’s not limited to just these jobs. There are other positions: virtual assistants; social media organisers; website copy writers; book formatters; translators. And a host of other specialised roles could be necessary, depending on the skill and budget of the author. Even the mega-famous, traditionally published author David Patterson – arguably the world’s most consistently profitable writer – hires a team of editors, PR specialists, and event managers to work alongside a troop of co-writers so he can get on with what he loves to do. 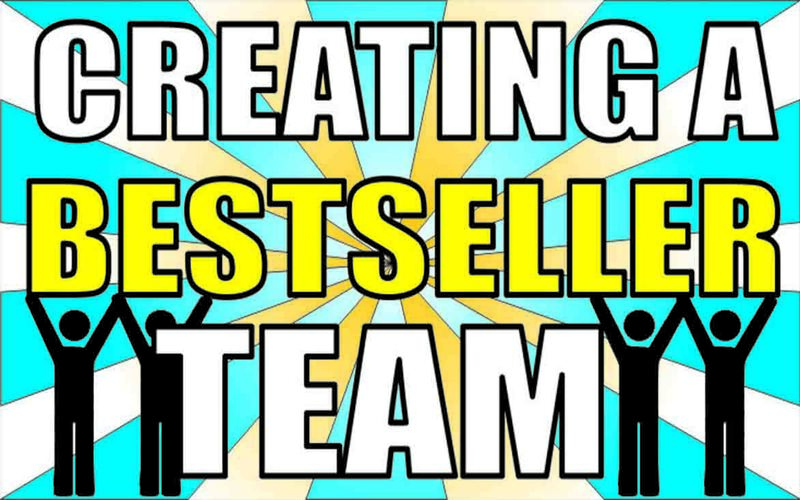 The evidence is conclusive; if managed successfully, authors can earn far more by creating a bestseller team than they could ever manage alone. What are your thoughts? Would you consider starting a bestseller team or do you think there’s a better way to manage your author workload? Leave a comment below! Also, if you want to help me become a multi-bestselling author, join my mailing list by clicking here. I don’t spam. I just send exclusive newsletters that give you early notice of events, blog posts, and when my books go on sale. And for my avid readers out there, you can become a part of my street team by emailing me directly via my contact page. Just include a short line, letting me know that you want my future releases for free ahead of their launch dates. It’s easy!